As Christmas draws closer, people all over the Western world have been preparing with great excitement, and Chinese people all over the world have begun preparing for the most important celebration in their calendar, the traditional Chinese New Year. It is always interesting to compare the two most important festivals from West and East. Firstly, the origins of the two festivals are completely distinct from each other. Christmas is the day when millions of Christians celebrate the birth of Jesus Christ. Countless joyful children wake up early on Christmas morning and look forward to lovely presents from the mysterious and affable Santa Claus. Compared to Christmas which has a fixed date, the date of Chinese New Year varies every year due to the Chinese Lunar calendar. 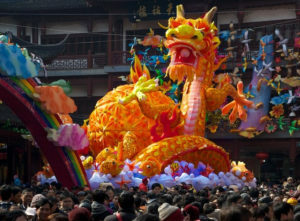 Generally speaking, Chinese New Year is around the end of January and the beginning of February. New Year’s Eve is the time for families to reunite and celebrate the festival with a splendid dinner. For the first three days of the New Year, people usually have a range of events and activities and visit their friends and families. Traditionally, the celebration of the Chinese New Year ends in another significant festival – the Lantern Festival, where people have glutinous rice balls named “Yuanxiao” or “Tangyuan” to treasure the last moment of families’ annual reunion and light various lanterns to show their wishes for the new year. In spite of these apparent differences, when Santa meets Nian, however, something intriguing happens. In recent years, China’s Christian population has reached over 100 million, which makes Christmas an increasingly significant festival in China. Furthermore businesses also find Christmas a great time for sales and marketing, as gifts are exchanged on the day. Santa has developed a fascinating strategy of ‘localisation’. Not being an official holiday in China does not prevent Christmas from being celebrated and enjoyed by an increasing number of young people in this large country. About the author: Lizhi (Roger) Zhao who is doing internship in TTC wetranslate, has been in the UK for over 3 years and has been granted an MA in Chinese-English Translation and Interpreting by the University of Essex, as well as an Academic Certificate of International Law by the University of Bristol. With good knowledge of law, culture and IT, he is passionate about becoming a professional and specialist translator. Follow Roger on Facebook (https://www.facebook.com/Roger.Zhao1986), Twitter (https://twitter.com/zlzroger) and Sina Weibo (http://www.weibo.com/roger1103).